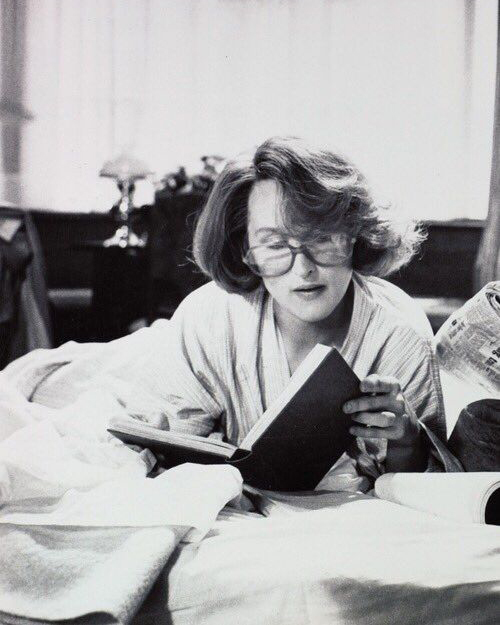 Meryl Streep reading. Image found via Pinterest, source unknown. “Stupid is not uncommon. Stupid is the way we feel when working on a difficult problem. Stupid is the emotion associated with learning – we are stupid and then we are not. The pre-learning state is stupidity. A scientist might work ten years on solving a problem of math or logic or biology. Or a lifetime. And until the problem is solved, she’s stupid. And then she isn’t. Which is all fine, actually. The problem comes with the emotion that we’re supposed to feel when we feel stupid: Fear. We are supposed to be afraid of stupid, to get stupid over with as soon as we can. Change, of course, makes everyone feel stupid, because change breaks all the old rules, inventing new ones, rules we don’t know (yet). And so the equation is obvious: Change → Stupid → Afraid. One way to avoid this is to avoid change. One way to avoid this is to avoid freedom. The best way to avoid this is to embrace stupid and skip the last part. From the book ‘What to Do When It’s Your Turn (and It’s Always Your Turn)’ by Seth Godin.